Chris Parker. Jersey Round Island Challenge 2017. Sat 12th August 2017. Title Mr.Mrs.Ms.Miss.Dr.Prof.Rev. Title is required. Email Address Email is required and must be a valid address. Mobile Phone Number Phone number is required. House Number / Name Property name is required. Street Street name is required. County Locality name is required. Country Please select United Kingdom Jersey Guernsey France Germany Afghanistan Åland Islands Albania Algeria American Samoa Andorra Angola Anguilla Antarctica Antigua and Barbuda Argentina Armenia Aruba Australia Austria Azerbaijan Bahamas Bahrain Bangladesh Barbados Belarus Belgium Belize Benin Bermuda Bhutan Bolivia, Plurinational State of Bonaire, Sint Eustatius and Saba Bosnia and Herzegovina Botswana Bouvet Island Brazil British Indian Ocean Territory Brunei Darussalam Bulgaria Burkina Faso Burundi Cambodia Cameroon Canada Cape Verde Cayman Islands Central African Republic Chad Chile China Christmas Island Cocos (Keeling) Islands Colombia Comoros Congo Congo, the Democratic Republic of the Cook Islands Costa Rica Côte d'Ivoire Croatia Cuba Curaçao Cyprus Czech Republic Denmark Djibouti Dominica Dominican Republic Ecuador Egypt El Salvador Equatorial Guinea Eritrea Estonia Ethiopia Falkland Islands (Malvinas) Faroe Islands Fiji Finland French Guiana French Polynesia French Southern Territories Gabon Gambia Georgia Ghana Gibraltar Greece Greenland Grenada Guadeloupe Guam Guatemala Guinea Guinea-Bissau Guyana Haiti Heard Island and McDonald Islands Holy See (Vatican City State) Honduras Hong Kong Hungary Iceland India Indonesia Iran, Islamic Republic of Iraq Ireland Isle of Man Israel Italy Jamaica Japan Jordan Kazakhstan Kenya Kiribati Korea, Democratic People's Republic of Korea, Republic of Kuwait Kyrgyzstan Lao People's Democratic Republic Latvia Lebanon Lesotho Liberia Libya Liechtenstein Lithuania Luxembourg Macao Macedonia, the former Yugoslav Republic of Madagascar Malawi Malaysia Maldives Mali Malta Marshall Islands Martinique Mauritania Mauritius Mayotte Mexico Micronesia, Federated States of Moldova, Republic of Monaco Mongolia Montenegro Montserrat Morocco Mozambique Myanmar Namibia Nauru Nepal Netherlands New Caledonia New Zealand Nicaragua Niger Nigeria Niue Norfolk Island Northern Mariana Islands Norway Oman Pakistan Palau Palestine, State of Panama Papua New Guinea Paraguay Peru Philippines Pitcairn Poland Portugal Puerto Rico Qatar Réunion Romania Russian Federation Rwanda Saint Barthélemy Saint Helena, Ascension and Tristan da Cunha Saint Kitts and Nevis Saint Lucia Saint Martin (French part) Saint Pierre and Miquelon Saint Vincent and the Grenadines Samoa San Marino Sao Tome and Principe Saudi Arabia Senegal Serbia Seychelles Sierra Leone Singapore Sint Maarten (Dutch part) Slovakia Slovenia Solomon Islands Somalia South Africa South Georgia and the South Sandwich Islands South Sudan Spain Sri Lanka Sudan Suriname Svalbard and Jan Mayen Swaziland Sweden Switzerland Syrian Arab Republic Taiwan, Province of China Tajikistan Tanzania, United Republic of Thailand Timor-Leste Togo Tokelau Tonga Trinidad and Tobago Tunisia Turkey Turkmenistan Turks and Caicos Islands Tuvalu Uganda Ukraine United Arab Emirates United States United States Minor Outlying Islands Uruguay Uzbekistan Vanuatu Venezuela, Bolivarian Republic of Viet Nam Virgin Islands, British Virgin Islands, U.S. Wallis and Futuna Western Sahara Yemen Zambia Zimbabwe Country is required. 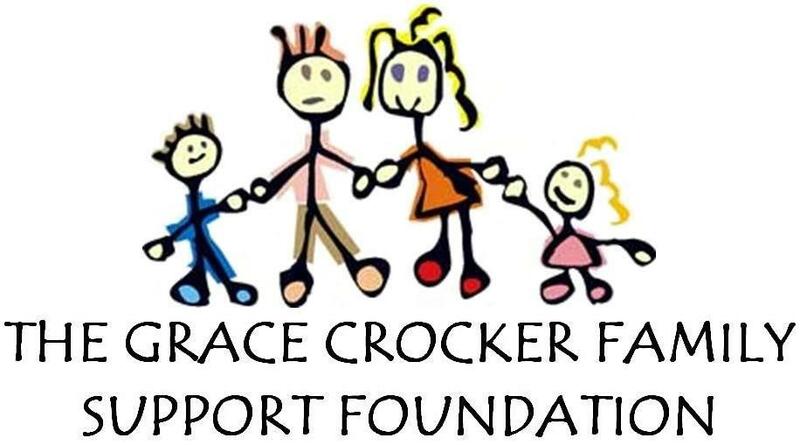 I agree to my details being passed on to The Grace Crocker Family Support Foundation for them to contact me in the future, about the important work they do. Please check the box to confirm you have read and agree to the payment terms. I have read and agree to be bound by the payment terms of this event. Race Nation provides online registration and fundraising for mass participation events through our platform “SportsGiving”, helping to raise vital sums of money for many good causes. On all donations we charge a small fee of up to 5% of the donation (which includes card processing charges). We do not charge a fee on any Gift Aid claimed. This means that if you made a donation of £10 with Gift Aid (worth £2.50), the charity would receive a minimum of £12.00. By ticking the Gift Aid box, and providing your details, you are allowing us to treat your donations as a Gift Aid donation. If the donation is to be divided by multiple charities you understand that the Gift Aid claimed will also be split in the same proportions. You confirm that you are a UK taxpayer and understand that if you pay less Income Tax and/or Capital Gains Tax in the current tax year than the amount of Gift Aid claimed on all your donations it is your responsibility to pay any difference. If this event is receiving charitable donations, I understand that my SportsGiving fundraising page is raising money for the nominated event charity (or charities). I understand that my SportsGiving page is raising funds for the listed charity partners only, and any raised funds raised will be paid directly to the listed charity partners. I also understand that I must not use my SportsGiving page to raise any funds for a charity not directly involved with the event to which I am registering. You can choose what personal information is displayed when you post a sponsorship message. Use the radio buttons to select your level of privacy. “Show all” – Your donation amount, sponsorship message and name will be displayed. “Hide donation amount” – Your name and sponsorship message will be displayed, but not your donation amount. “Hide your name” – Your sponsorship message and donation amount will be displayed, but not your name. "Hide your donation amount and name" - Both your donation amount and name will be hidden from the public page, but your message will still show. The GCFSF is a local charity, founded in 2011 by Sara and Nigel Crocker in memory of their daughter Grace who sadly died in September 2009 aged just 11 weeks. The family spent nearly five months in Southampton and from that experience understand just how difficult it is for Jersey families with sick children, who desperately need treatment in the UK. The charity have supported many families in Jersey providing valuable funds so that they can focus on the health of their child. This includes help in funding: flights for family members, food and everyday living expenses, additional travel costs, rent/ accomodation in the UK and mortage/ rent on Jersey properties whilst they are away.